There I was inching my way down a glacier but that was a relief. The challenges were all accomplished and all we could think of was getting back to our vehicles. Our bodies had withstood all that we had asked of them. There was still another 12 miles of back country to walk and many beautiful mountain scenes, valleys, rivers and lakes to see on the way. Along the way we had caught and eaten wild mountain trout almost every evening. 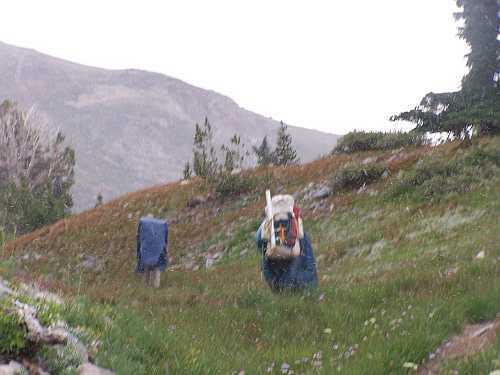 I had portaged a float tube, no small feet, through miles and miles of back country up and down many thousands of feet in elevation, sometimes in the same day and sometimes in the same hour. I had float tubed many lakes that had seldom seen a float tube and had gotten the wild eyed look of wow someone brought a float tube all this way! We had traversed where the pioneers came through with their wagons. Some of them survived the pass some of them never were heard from again. I have to say this was my first experience with a snow storm in August at high elevation. So much for global warming up here. 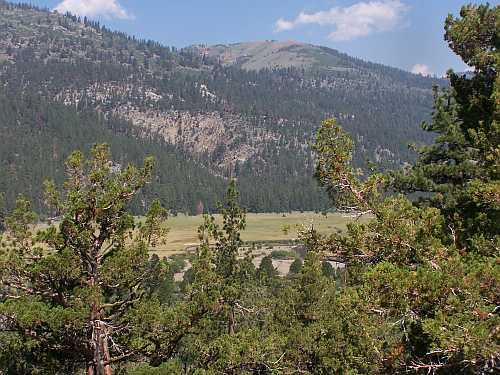 Yes, it all started in beautiful Leavitt meadows located in the Eastern Sierras. Gary and I had met up just as I arrived. In a few minutes we were crossing a bridge over the Walker River and out through a meadow on to our first stop, Fremont Lake. On the way the temps were warm, the sky blue, the streams flowing and the trail dusty. Along the way we picked up two more club members, Mike and his wife Pat, who we met up with on the trail to Fremont Lake. We arrived at Fremont Lake and found Tony resting from the long hike. I set up my tent and not long after had my float tube in the water. It was windy but I was able to cover quite some distance. I measured the lake water temperature with my thermometer and found the water to be in the 70 degree range. The lake was also quite weedy for a higher elevation lake. I did not catch any fish at Fremont Lake. The next day we were off to Cinko Lake. Once we arrived, I set up my tent inflated my float tube and went fishing. 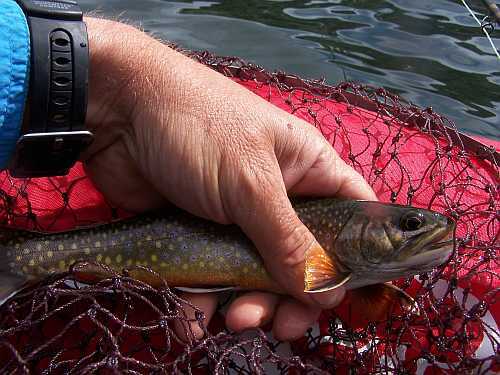 This lake had some smaller brookies. I was able to catch enough for a good meal at this lake. The float tube gave me several advantages at these lakes. I was able to search the whole lake for fish. I was able to get to places that you could not cast to and I was able to fish structure that most of the time could not be seen from shore. The next day we were off on a long hike through Emigrant pass and ended up camping near Middle Emigrant Lake. Emigrant Pass is where the pioneers with there Conestoga wagons passed though on their way to the gold fields and other destinations probably along our very own Barbary Coast. 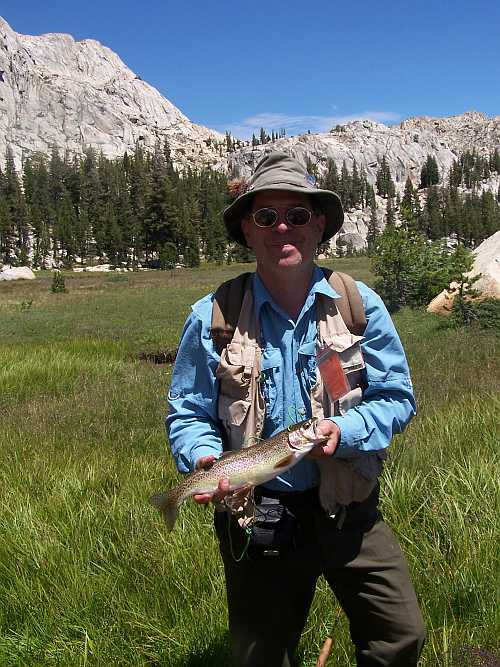 After we set up camp Gary and I headed to Lower Emigrant Lake with the idea of catching some trout for dinner. As I was getting my float tube together Gary caught a very large rainbow trout. By this time I was ready to get going. The lake was silted in were I launched my float tube from so I decided to fight the wind and head over to the deeper side of the lake. This paid off nicely as I caught some of the biggest trout of the trip at this end of the lake. Needless to say we had a nice meal of trout that evening. In fact we ate trout until it was coming out of our ears. After the nightly discussion of where we were headed the next day over a nice cup of hot coco, rum and cookies we all hit the sack, our bellies full of gourmet trout almondine. The next morning we left bright and early after breakfast. From the previous day Gary and I had found the trail to our next destination, The Twin Lakes and I had marked it on my GPS. Tony and I headed off first. 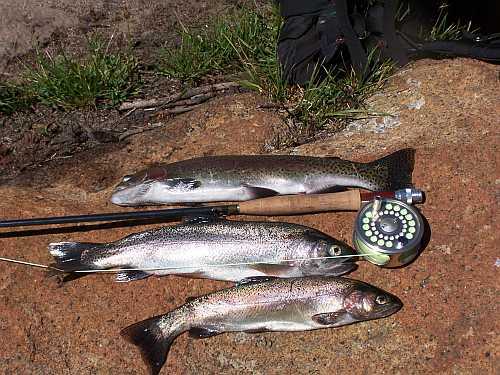 There was a promise of good sized rainbow trout at our next destination and the weather was clear so far. On our way in everyone had promised us rain but so far their promises were untrue. After much hiking through the beautiful Eastern Sierras crossing a stream or 2 and I must say up some steep switch backed hills. In fact this trail was steep enough that we took some extra breaks along the way. After quite some time on the trail Tony and I reached the first Twin Lake. We looked around for a decent camping spot and found one across an outlet stream coming from the lake. We decided then that we would not venture to Twin number 2. There was no one there when Tony and I arrived. We had pretty much our pick of spots and we found a rather nice horse pack camp to set up camp. Once I set up my tent and got things squared away I inflated my float tube and went fishing. The lake was a beautiful lake not extraordinarily large but pristine. There were huge boulders in the lake that I had been finding trout around in previous lakes. Not too long after I launched my float tube I had a strike. It was a nice small rainbow that I released. We had come to a consensus on what we would keep and how many we needed for dinner. There were quite a few trees around the shore and the wind was blowing so if I had to cast from shore there would be slim pickings. Instead I fished the whole lake catching quite a few nice trout. They fought like crazy jumping and shaking their heads, typical of truly wild trout. The weather started changing around 2 in the afternoon. The wind picked up and the clouds overhead started to gather. We got a few Sierra type summer showers. The water temperature at this lake was quite a bit cooler. Again at dinner time I was glad I had brought my float tube. We had a nice trout dinner to our fill with soup as a side dish. Dessert was cookies and hot coco with rum. We ate till we were full and after sunset turned in under the brightly lit night sky complete with twinkling stars. The next day we had our usual breakfast in the wee hours of the morning which was usually before 6am. It looked like we were going to get some weather today. We were on our way to Dorothy Lake, which is one of the sister lakes. On the way we would pass by Bear Lake and Bigelow Lake. Bigelow Lake is a lake that at one time supported a mine. There are old roads and camps there but there has been no mining activity for quite some time and of course no access to vehicles. Also there was Snow Lake on the regular trail but Gary had been there and told us it was barren which may have been the result of the mining operation. When we reached Bear Lake the weather finally opened up and it stared to shower freezing rain, hail and snow at us. We threw on our plastic ponchos and kept going. By the time we arrived at Bigelow it was coming down! We found some shelter under the trees and took a quick break, taking in the beauty of Bigelow’s man made rock dams and surrounding beauty. We decided to cross country travel at this point taking a trail that was not so pronounced over a ridge. It was a goodly climb but not so hard. Once up on top of the pass we veered left trying to pick up a trail again. We ended up on a rather steep cliff that was all boulders and steep rock ledges. It was snowing/hailing and windy so once out on a ledge we had to make some quick decisions. The rocks once frozen were tricky to walk on. We decided to climb down the mountain and hit the Pacific Crest Trail below. Slowly but surely we did this finding our own routes and meeting up on the PCT. From there Dorothy Lake was a hop, skip and jump away. We arrived at Dorothy and Tony found a camp along the PCT. I went off at the same time to find something a bit off the PCT. Along my hike I ran into another backpacker who had a nice toasty fire going. He invited me over but I thanked him and declined. I talked to him for a bit but I was thinking if I stop now with this cold I will not want to move to quickly after. Climbing on that mountain and going cross country had zapped my strength and I need some soup, a warm fire and to just set a spell. Later Tony Gary and I met up at Tony’s camp. I got my tent set up and started a fire, had some soup, warmed up and felt much better. I got my float tube going and began to fish. There were some shallow spots I ran into at first. 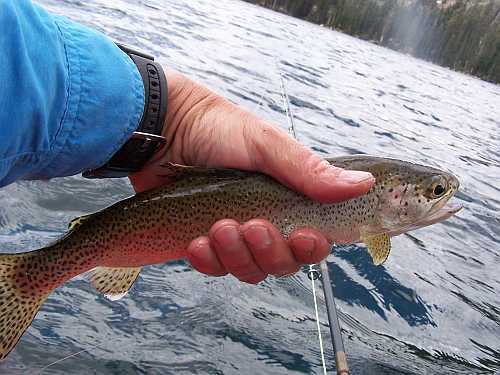 Once I got the lay of the lake I found some structure and I was into many, many wild rainbow trout. Again we would have a great dinner for 5 with no problem. I unfortunately lost Gary’s pack net here. Some how the knot untied and the net went sinking off. I still managed to land some nice trout but now our next destination had been rumored to have trophy Golden’s and I had no net. Friday morning we woke up in the pre dawn hours to find clear skies. The moon was still up along with a few twinkling morning stars. The cool crisp air felt good on my face. I was finally getting in sync with nature and as is usually the case, time to go home was getting near. We made our quick breakfast and proceeded to do the morning ritual of packing up and heading out. One thing that is reassuring is that this is the usual way I backpack, never staying in one place too long and this is the way Tony and Gary are as well. I have to say to myself “What a coincidence”. 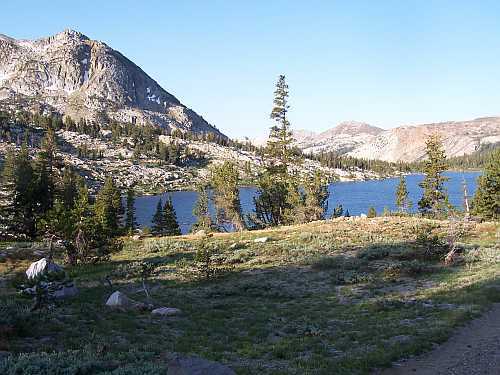 We headed off on the PCT and arrived at Ruth and then Helen lakes, The Sisters of Dorothy. That is why these lakes are called the sister lakes, that and they are in a pretty close proximity to each other. We noticed that there were very few if any rises at these lakes. Also the DFG had placed nets at an outlet. We noticed the nets first and then the DFG cards attached to the nets. We were not sure if they are trying to trap spawning fish or stop fish from leaving these lakes. 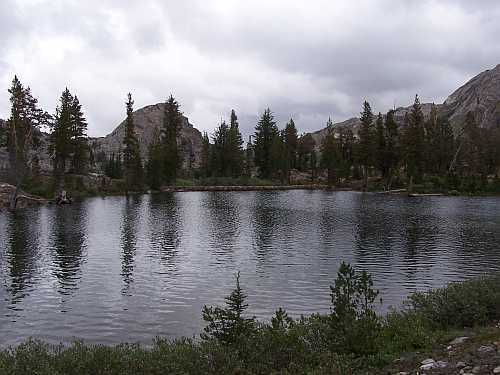 I do not believe these lakes are part of Yosemite so the DFG does have control of these lakes. 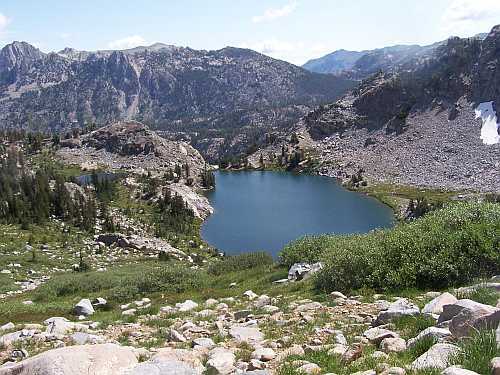 These are beautiful lakes within the usual scope of High Sierra’s scenery. We then proceeded to climb to the top of a pass on our way to Mary Lake, which was rumored to have trophy golden trout. We reached the top of an 11,000 foot pass and the view was spectacular. You could actually see where the glaciers carved these mountains and if you looked closely you could imagine how the glaciers flowed in and out of this hidden valley. Off to one side we could see Tower Lake. We took a while to look and see what the best approach would be to our next pass without losing too much altitude. Down and across a large boulder field seemed to be the best way. 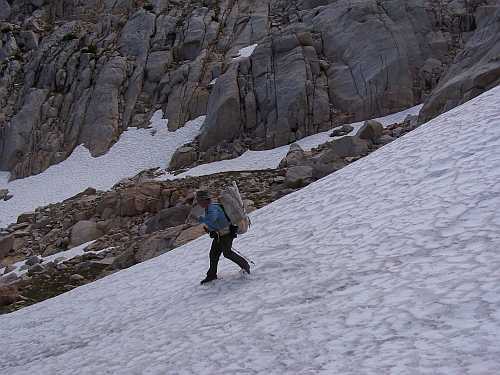 You need to be very careful here as on slip on the granite with a heavy pack could be extremely hazardous. I had found out how sharp this granite is from earlier in the morning. While making the fire for breakfast I stumbled in the dark and put my hand down hard on a granite rock. It cut my hand like a razor. Although I only received a superficial cut, it was one that took off skin and meat, ouch! Along the way there were small streams in-between the bolder field from the melting snow and some of the green patches we traversed were real soggy. As we rounded the mountain on the diagonal we lined up with Tower Lake and headed up to our next pass. As we approached our pass we were amazed at the wall of ice that was now in our path. To both sides were steep mountains which did not look as if they could be easily scaled with large packs. As we sat there pondering on how to cross this obstacle Tony started up one of the steep mountains to find a route. Meanwhile Gary tried for a go up the ice wall. The ice wall was not a viable option we soon found out. Then Gary went up the cliff to try and find an alternate route on the same mountain Tony was climbing. You should have seen Tony climb up this mountain. The guy is like Spiderman! He looked like a spider with a backpack on, it was quite a sight. In the mean time I was pondering on if I should try the boulder field next to the wall of ice which was looking better all the time. Needless to say I ended up taking the route Gary found. It looked pretty do able with a few tight spots. Kind of like one would think of climbing a chimney in rock climbing terms. We eventually all made it over unscathed took a short rest before climbing a small steep green patch at the top of this cliff. We would definitely not come back down this way unless we lowered our packs first, just way too steep. We got to the top of the pass and were shown another spectacularly beautiful glacier carved valley with the pearl, Mary Lake, at the bottom, we were here! We had a short hike down to the lake over a vague trail. We could also not believe that there were signs of either a mule or horse up here. It is extremely rough, steep terrain. We found a nice spot to camp and proceeded to set up. The weather was cold and ugly but we had come here to fish so as usual I got my float tube ready and headed out. I had put together a make shift net made out of a small stuff sack and a tulle reed. Mary Lake was feed by snow melt from the surrounding glaciers. The water was very cold compared to all the other lakes that we had visited. As I paddled around I thought I saw some fish on the bottom, the water was extremely clear and pristine. I did not get a bite and I paddled the whole lake. When I talked to Gary and Tony they both had gotten strikes but never hooked any thing. The water might have been just too cold and the fish were not moving. Also there was a weather front right on top of us the whole time. It looked like it would open up on us at any moment. I fished until I was too cold to care and then went up to camp to get some soup in me and warm up. We pretty much left it at that, we did not see any rises that evening or the next morning and the next morning we were off headed on our way home. We had a steep pass to negotiate and the weather was unpredictable at best. On our way back we took the bolder field along the ice field and that is were you see the picture of me coming down the mountain. Once we got to the bottom of this valley we made it over to Tower Lake which did not have many rises and also had a DFG net strung across the outlet. At Tower Lake there was a trail and we were on our way home. It was a long hike out. We hiked about 16 miles. There were many beautiful streams and meadows along the way. 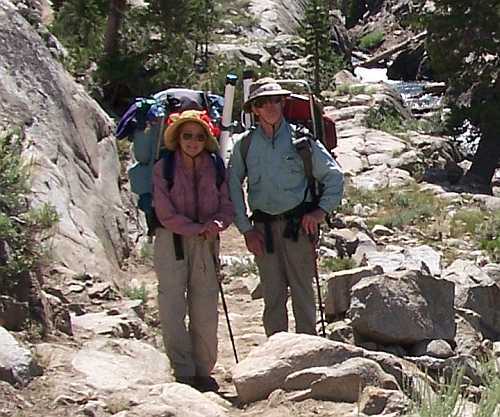 As we neared Leavitt Meadows we would encounter more and more hikers along the trail. Once we got real close to our vehicles the families with kids were on the trail. I encountered someone that looked like Roy Rodgers on the trail, horse and all, except he was definitely not riding Trigger. The horse reared a few times and I had to climb down off the trail in order for Roy to get his horse through. Yes we were back to civilization a both welcomed and unwelcomed site.